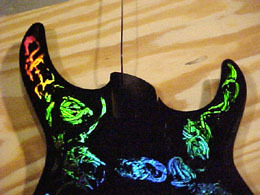 Holoflash finishes are spectacular and eye-catching finishes that set any instrument apart from the rest. Surprisingly, they're not that hard to do! 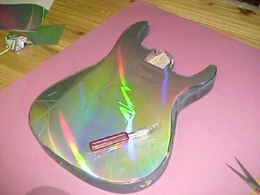 Start out with your plain holographic material cut down to the approximate size of your guitar's body. 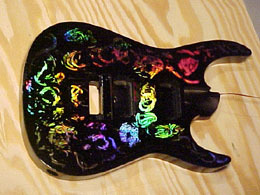 This particular finish is easy to do but will require plenty of patience and a massive amount of clear coating. Peel the backing off and slowly roll the material onto your body. 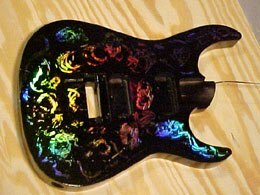 It is not necessary for you to start out with a bare wood body - it is much easier to start out with a finished guitar body since the smoother surface allows the adhesive to stick better. You can either rub it down by hand or using a spatula - I prefer by hand myself. Trim around the outside using a brand new blade to make the job easier and reduce the chances of the material tearing instead of cutting. If you need to, cut lines and lap the material down around odd curves and contours on the body. You can see that has been done on the arm rest area of this particular body due to a contour that wouldn't allow the material to sit flat. Ideally the surface should be smooth however it is likely that you will encounter spots with miniature bubbles or bumps. 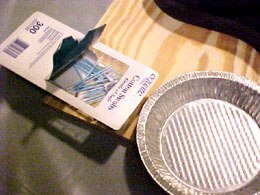 Just pierce through these with a pin to release the trapped air and press out the bubble with your nail or a popsicle stick to ensure the material is adhered to the body properly. Don't worry if it is not perfect as they will disappear into finish and possibly make an attractive ray of reflection later! After you have trimmed the excess off, you're ready to get started on the painting part. Give the entire body a complete single coat of whichever color you desire, covering the material as well so that it is barely visible or completely obscured from sight. 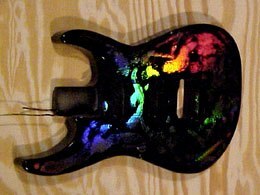 Funny how the flash shows the rainbow but without the high intensity light it's a completely black guitar! We're going to start working with Acetone solvent now - whilst it should be harmless to the holographic material it will wipe paint off and also destroy you in the process! Take the proper steps to work in a well ventilated area with no sources of ignition. Acetone is hugely flammable and concentrated fumes will melt plastics in close proximity. Including the lenses in your glasses! 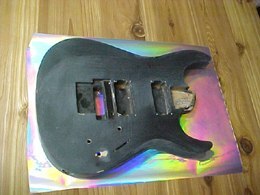 Whilst the paint coats you applied to the body are still drying, take out a tin or glass container (not plastic) along with protective gloves, Acetone plus lint-free cloth and/or other clean Acetone-resistant applicators. 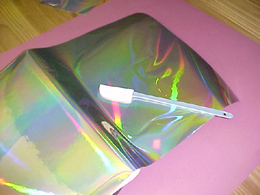 For big thick graphics use a clean cloth and rotate the clean part often dipping it into the Acetone as you wipe away your personal design on top of the holographic material. After you have finished removing as much of the paint coat as you want, it is time to let the remaining paint dry completely for a minimum of a couple of days. Longer is always better of course. Now for the hard part which takes a lot of patience - clear coating. Following the instructions with your particular brand of clear coat, spray successive layers allowing each session of spraying to dry completely before the next. 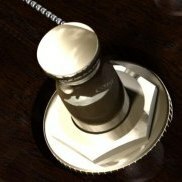 Generally, off-the-shelf rattlecans have a far higher solvent content which slows the curing process down considerably (weeks rather than days). Specialist car paint suppliers may carry "2K clear in a can" where the rattlecan has a separate compartment of hardener which is released and mixed into the clear prior to spraying. This cures ready for the next coat within an hour or two but requires specific attention to safety; full ventilation, no sources of ignition and skin cover! Read the safety information and if in doubt, ask your retailer or a specialist! Now that you have waited for your clear to dry, keep repeating the clearing process until you have built up a substantial covering layer. Yeah, it looks pretty nasty on top I know - plenty of nibs sticking up and all - but hey it'll all smooth out in the end! After all of your multiple clear layers have had plenty of time to cure you can start levelling off the top with a block sander. Do this by hand so that you will have plenty of control over the process. Read the advice below and also keep in mind the picture you see to the right is at the 800 grit stage so don't try to achieve this right off the bat cause you will destroy your finish. Mix up a spray bottle with warm water and a little basic ivory soap, or other neutral hand soap that doesn't contain oils, moisturisers or other "caring" ingredients. Start out your sanding with 400 grit wet-n-dry paper on your sanding block, spritz the surface lightly and proceed to knock off just the tips of the hills, nibs and high points. DO NOT sand down to the low points at this stage! You want to do this using mostly dry paper not completely wet. Just enough water to stop the paper from "loading up" with the gunk you're sanding off. Blow off the dust and lightly brush it with a clean cloth often so you can see the progress you're making. 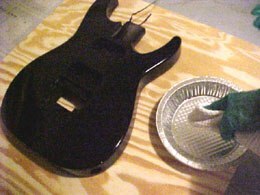 Once you have taken off just the tops of the ridges it is time to clearcoat the body again with a few good medium coats and again, allow the paint plenty of time to dry. Repeat the process of block sanding once the clear has dried using the next highest grit of paper - 600 or 800 wet now. The body will develop a milky waste as the clearcoat dust mixes with the water. Wipe the body clean often to monitor your progress. After you have knocked off the tops of your high points you should see the low areas become smaller. Always concentrate on the high areas, not on the low areas! Once you have naturally reached these low areas by knocking down the high ones, it is time to clean the top of any residue and apply another 3 good coats of clear. By now you're getting the idea of why it takes patience and tons of clear to get this finish to a point you can be proud of! Hopefully by this point you haven't gone through any of the edges. 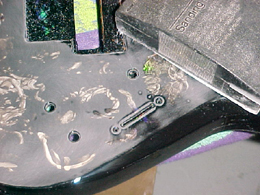 Edges are usually the hardest part to keep intact whilst preventing "sandthroughs". 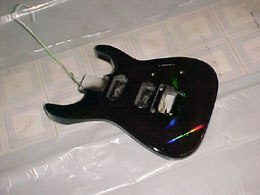 If this happens, whip out your spare color and spot paint where you have sanded through. 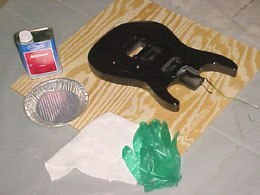 Spray the area so that overspray heads away from the guitar and not further onto it! After drying clear over the top again with 3 medium good coats. Continue the process of clearing and block sanding until a minimum of 1000 grit. By this point you should have no remaining high or low points and the surface should appear smooth and even. From here you're ready to go through the grits wet-n-dry sanding 1200 grit to 2000-4000 and then buffing. You will now be finished! Your body will change colors completely as you walk by it or appear silver in color head-on in low light. It never looks the same and you will love the results! How to do a "Holoflash" finish by Brian Calvert is licensed under a Creative Commons Attribution-NonCommercial-ShareAlike 4.0 International License. This is a super-old article, so products and sources change. 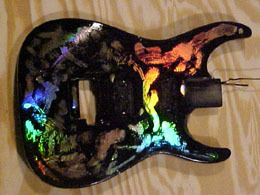 "Holoflash" is more the nickname given to the finished look. 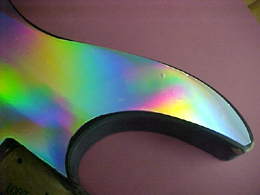 Google around for "holographic plastic" or "iridescent plastic". It's still a simple material to get ahold of, plus there are more patterns and random looks to it these days.